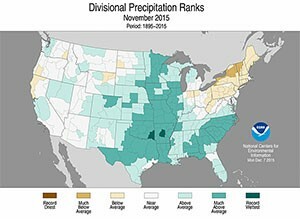 NOAA released their November and autumn climate summary today. 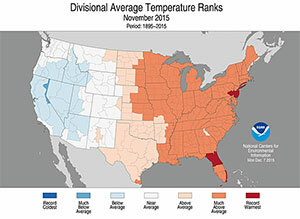 It shows that this September through November was the warmest on record for the contiguous lower 48 states since 1895 (the previous warmest was 1963), and that the year to date (Jan-Nov) is the 5th warmest on record. The maps below show the rankings by climate division across the US. 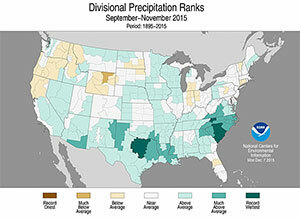 You can read the official report athttp://www.ncdc.noaa. gov/sotc/summary-info/ national/201511. 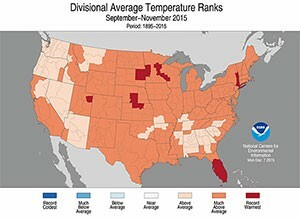 One of the things that helped push the temperatures to record levels was the consistency of warm temperatures across the entire country; only one state, Florida, also experienced a record warm fall. Weather Underground also has a long and detailed write-up about the fall and the continuing warm December conditions here.